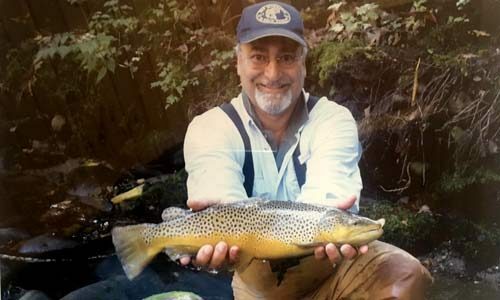 Fish with Guide Ed Hudon in The Great Smoky Mountains of North Carolina! Posted September 14, 2017 by admin & filed under Fishing Stories. For those of you that picked up this magazine because you have interest in fly fishing but can’t get started, this article is for you. Before July 2005, I only tried fly fishing a couple of times by myself. Because I didn’t have any luck, I lost interest. Then in July of 2005, while looking for a log cabin to buy in Bryson City, my wife and I made a side trip to Asheville. While there, I can across Hunter’s Bank Fly Shop. I went in and said I wanted to fish the Davidson River. I mentioned that I had very little experience. The owner said, “ That’s ok, I will set you up with Forrest Marshall. He knows the Davidson real well. I met Forrest at the fly shop two days later. We proceeded to the Pisgah Forest in Brevard, NC. Once we got there, we started to fish next to a bridge. Right away I started catching fish in the 12-14’’ range. I was having a great time. While this was going on, Forrest kept looking up the river where two other guys were fishing. He said, when they leave, we’re going to take that spot. A half hour later, they left and we moved up. Once you get “hooked” and start to fish on your own, experiment with different size flies, tippets, etc. Share your fly fishing experience with a son, daughter, or a friend. I’ve been guiding for 5 years. I love what I do, especially when I have new people that have never fly fished before, have a great time, and want to come back and do it again ~ next time even better. HOWEVER – you must start….